Traditionally the installation of shower enclosures or bath screens has always been something that falls either to the plumber or the carpenter on a construction site. However, with our heavy fully frameless shower enclosures this job has become far more specialist as there are absolutely no metal channels to allow for fitting adjustment. With frameless shower and bath enclosures becoming larger and heavier, simply handling the glass and getting it into place is a skill in itself and the enclosures must be measured 100% accurately and fit the space perfectly. Measuring for enclosures with 2 or 3 sides and, particularly, angled corners can pose a problem for a non-specialist and can cost thousands in costly re-makes and time if things go wrong. All Showerpower™ bespoke frameless shower and bath enclosure installation is undertaken by our specialist and highly experienced installation team. 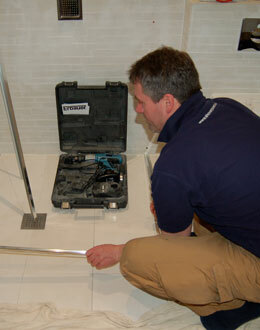 They carry out a full site survey, measuring and also templating when necessary. This ultra-specific measuring process completely eliminates the risks often associated with ordering made to measure products. Our installation service comes with guarantees of a perfect fit and is backed up with our promise to deal promptly with any rare aftercare issues. This level of skill and attention to detail means our trade customers can confidently hand the whole responsibility for the working and fitting of the bath or shower enclosure to us, knowing that however challenging the job, it will be completed on time and on budget for their client. And of course, in the rare event of any issue post fitting, we are on hand to step in quickly and remedy it. To find out in more detail on the installation of bespoke shower enclosures and shower doors click here. © ShowerPower 2018 All rights reserved. Showerpower and Vetro are trademarks of Homeside Services Limited.